A study published April 10, 2018, in the Lancet Journal showed an increased long-term risk for dementia in Danish seniors that had suffered in the past a traumatic brain injury (TBI). The study was headed by Professor Jesse R. Fann MD, of the University of Washington who worked together with Dr. Jakob Christensen of Aarhus University Hospital in Denmark. The overall risk of dementia in seniors who had a history of TBI was 24% higher than seniors who had never had a TBI. The study was carried out on 2.8 million Danish seniors over the age of 50. The researchers discovered that a higher number of traumatic brain injuries in a person increased their chance to get dementia. Also, the more severe the TBI was, the greater was also the chance to contract dementia. A severe TBI increased the risk for getting demented by 35%. Even a mild concussion increased the risk for dementia by 17%. Most TBIs are from unintentional falls and from road accidents. Sports, extreme sports and military exercises and combat also contribute to traumatic brain injuries. The study shows the importance of finding ways to prevent traumatic brain injuries. Wearing helmets when riding bicycles, wearing a seat belt in a car, wearing helmets when playing football, soccer and other sports. Research from other studies has also shown that traumatic brain injuries lead to a higher risk for Parkinson’s disease. Army veterans who had TBI have a 56% greater chance to get Parkinson’s. Also people who had repeated traumatic head injuries (TBIs) had a greater chance to develop Amyotrophic Lateral Sclerosis (ALS) also called Lou Gehrig’s Disease. It had been noted that soccer players in Italy had a very high risk for ALS and it was assumed this was due to repeated head injuries, especially by hitting the ball with their heads. 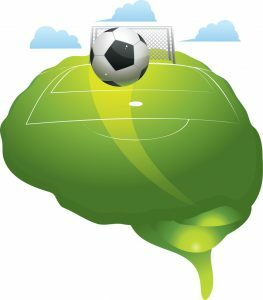 In fact, a study published in EBioMedicine November, 2016 by researchers in the UK noted that hitting a ball with their heads led to instant brain damage in soccer players. Since even mild concussions have been associated with a higher risk for neurodegenerative diseases like Alzheimer’s dementia, Parkinson’s disease and Amyotrophic Lateral Sclerosis (ALS) also called Lou Gehrig’s Disease, much more has to be done to prevent the brain from trauma from falls, road accidents and sport injuries. Seniors are especially prone to unintentional falls that can lead to serious injury, disability and even death. See our blog from March 26, 2018, on Effective Interventions to Prevent Falls in Seniors. If your loved one has dementia and you are in need of a skilled nursing rehabilitation and care facility, you might want to consider Royal Suites Healthcare and Rehabilitation in Galloway Township, New Jersey. They have a state-of-the-art memory impaired care unit. For more about memory care please see our earlier blog from May 29, 2018.